Raymarine SeaTalk NG Terminator In order to ensure correct data transmission through a SeaTalk system, a dedicated Terminator is required at each end of the backbone cable run. DO NOT attempt to run a system that is not correctly terminated. 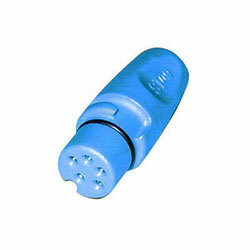 Do not use SeaTalk Terminators on Spurs, use a Blanking Plug to terminate each unused spur connector on 5-Way connectors and T-Pieces.